Hilary Ravenscroft Ford learned to draw and paint at an early age, encouraged by her maternal grandfather who was also an artist. She received several certificates from the Royal Drawing Society in London, England and received top marks in fine arts in her school leaving certificate. She studied at Maidstone College of Art (now Medway College, and an affiliate of London University) for a four year degree in Graphic Design. Some of her instructors included Elizabeth Frink, Agnès Sorel, David Hockney, John Plumb William Stobbs and Brian Wildsmith. For many years she pursued a varied career in graphic design and advertising, during which time she obtained several awards in both Canada and the USA. Her works were seen in national productions such as TSN, Flare magazine and she did some designs and layouts for the federal Government in Ottawa. A poster is displayed in the Sports Federation building in Ottawa. Hilary has given classes and clinics in Fort Erie (Ont. ), Hawkesbury, Montréal, Notre Dame de Grace (Que), Dalhousie (N.B. ), Cape Breton, Ottawa, Vankleek Hill (The Alpen School of Art) and at the Centre d’Acceuil in Lachute and Montebello (Que). She was art teacher/moderator for the Women’s Art Society Studio Group in Montréal and has been involved with art groups throughout Canada. She still gives the occasional class or clinic but devotes, time permitting, the rest to painting and drawing. 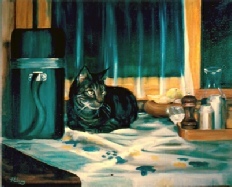 Hilary enjoys portraying her subjects in all media including pastel, watercolour, egg tempera and oil. 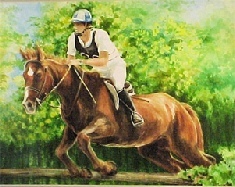 Her subjects include portraiture (involving many commissions, including CEOs) of the human, equine and canine variety. Other subjects include boats, and water scenes, equestrian pursuits, anything that involves people. Her belief is that this is the world made by man and he/she is part of that world. 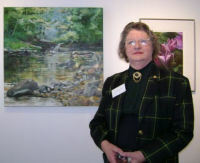 Her works have been displayed in numerous combined and individual shows across Canada, in Ontario, Manitoba, New Brunswick and Quebec and in London, England.